I moved recently. And while it was completely overwhelming, it was also really exciting. Sure I have a ton of boxes left to unpack and I feel a little like a nomad right now. But the fun part is that I get to reinvent my space and how I organize it. 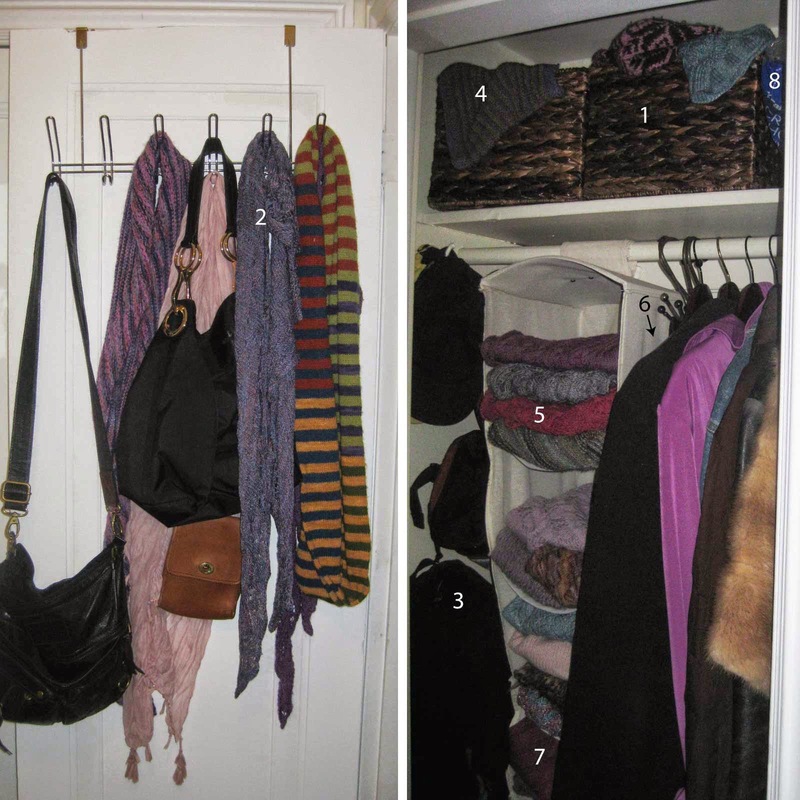 The one space that seems to stay the same (more or less) from apartment to apartment is the front hall closet. As I was unpacking my coats and winter accessories I couldn’t help but wonder how a front hall closet of a knitter might look to a non-knitter. Since it is nice and neat (for the moment anyway), I was eager to share it with you and ask if you if yours looks similar. Basket full of hats – that is overflowing. Scarves and cowls I wear on a regular basis are carefully hung over hooks…funny how for the most part they all seem to be in the same color family. Large Namaste bag…perfect for traveling and larger projects with lots of pockets for holding multiple small projects and knitting notions. Basket of cowls – also overflowing. Scarves that aren’t in my daily repertoire, but still on ‘active duty’ neatly folded in sweater hanger. Bag of project bags that aren’t currently in use…but are there in case of emergency. Felted purse I made for a wedding. Cabled knitted bag…one can never have enough bags. Bag from Squam Arts Retreat – perfect for a project or as a Farmer’s Market bag. Cabled toppers for my Hunter boots. Mittens in the bottom of the hat basket. Does your front hall closet look the same? I have a sneaking suspicion it does. I wish I had a hall closet. If I did, you would be right - it would look just like yours!